The Haddonfield girls tied a state record and the Deptford boys made history at Saturday's NJSIAA South Jersey, Group 2 Championships at the Bennett Center in Toms River. 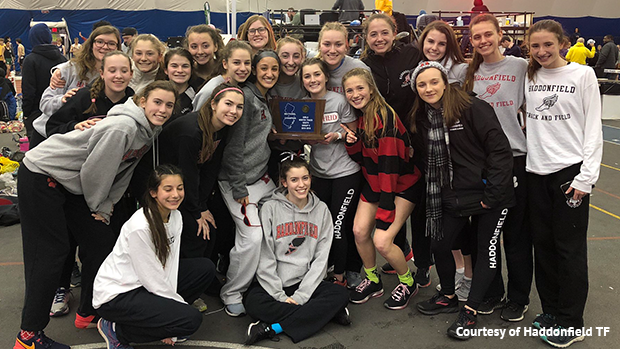 With its dominating 112-63 victory over runner-up Delsea, the Haddonfield girls have now captured eight sectional titles out of a possible 12, which equals the state record. The Haddonfield and Bernards girls and Rahway boys have all won a state record eight sectional championships. The Haddonfield girls received a huge spark from its incredibly talented group of sophomores, great contributions from its upperclassmen, and scored in very event except the shot put on the way to its milestone victory. Senior Jennifer Scott was a double winner for the Dawgs, capturing the pole vault in a NJ#9 11-0 1/4, and the 55 hurdles in 9.06, both personal bests. Scott was followed in the hurdles by teammates Grace Kegler, second in 9.15, and junior Rachel Bonnet, third in 9.34. Bonnet also won the high jump by clearing 5-0. Sophomore Robin Rosen placed second for Haddonfield in the high jump (4-10) and third in the pole vault with a PR of 9-0. Sophomore Lindsay Colflesh won the 800 in 2:21.34 and was third in the 400 in a PR of 60.35. In the 1,600, sophomore Sarah Naticchia won in 5:16.49, sophomore Payton Weiner was fourth, and sophomore Olivia Stoner was fifth. It was just the third career 1,600 for Naticchia. In the 3,200, sophomore Allison Colflesh was second in the 3,200 (11:49.01), junior Lilly Sirover was third (11:54.90). Haddonfield also placed fourth in the 4x400 in 4:19.80 as Lindsay Colflesh, Stoner, Gabby Barranger, and Riley Smith shared the baton. 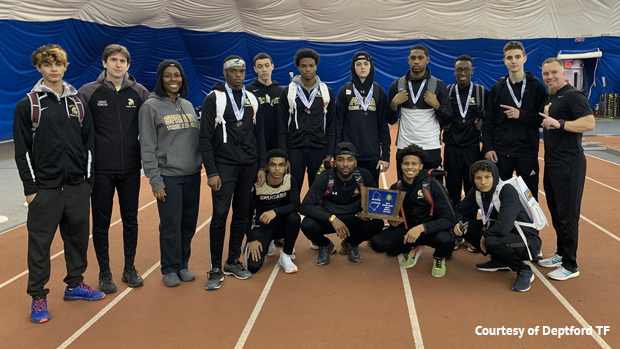 In the boys competition, Deptford used its speed and jumping depth to outscore runner-up Haddonfield, 87-81, for its first indoor sectional title ever. Seniors Marcel Washington (5-10), James Lynch (5-8) and Tyrece Brown (5-8) went 1-2-3 in the high jump, and seniors Naseem Smith, Javon Sanders and Tyriq Bundy went ran 1-2-4 in the 55 hurdles. Smith led the charge in the hurdles with PR, meet record and NJ#3/US#14 7.46, Sanders was second in 7.75 (7.72 in the trials), and Bundy crossed fourth in 7.99. Bundy also placed second in the 55 dash and teammate Khion Smith was third in the dash and second in the 400. The dash was won by Malachi Melton of Cedar Creek in 6.49, which is tied for NJ#5. Brown was also fourth in the 400 and 51.12 and sixth in the 55 in 6.85, and Lynch placed third in the pole vault (13-6), and Amadu Jalloh was fifth in the 800 with a 2:04.23. Deptford capped of its memorable performance by placing third in the 4x400 relay 3:29.17. Haddonfield, bidding for its seventh title, did its usual damage in the the distance races, piling up 56 of its 81 points in the 800, 1,600 and 3,200. Zach Murray, the state leader in the 400 at 49.38, won the 400 for Haddonfield in a SJ Group 2 record 49.93, Derek Gess was first in the 1,600 (4:26.67), and Martin Riddell crossed first in the 3,200 (9:49.64). Gess also took second and Ethan Spellmeyer third in the 800, and Greg Eisenhower and Riddell went 3-5 in the 1,600, and Eisenhower and Stephen Kasko grabbed the 2-3 spots in the 3,200.